I have Mitch Resnick (or, more specifically, his published work) to thank for sending me down the rabbit hole of innovation in education a few years ago. Mitch Resnick (aka Dr. Mitchel Resnick, LEGO Papert Professor of Learning Research at MIT’s Media Lab) is a legend in the field of technology education; his aptly named “Lifelong Kindergarten” group of researchers are the brains behind Scratch, the free programming language for kids, and Mindstorms, the programmable version of Lego. Their group’s mission is to develop technology for children to help them “grow up as creative thinkers”. So how exactly does this work? I discuss his vision and his group’s work in the post below — learning about his views has forced me to re-examine some of my own beliefs about technology in education. Would love to hear your thoughts! Do these ideas resonate with you? Is this preaching to the choir? Gave you some food for thought? In “All I Really Need to Know (About Creative Thinking) I Learned (By Studying How Children Learn) in Kindergarten” Mitch Resnick describes how the kindergarten play approach and materials inspired his group to develop the technological equivalent — tools that allow children to express themselves digitally. I’ve included some highlights of his compelling vision below. Look familiar? Mirrors the design thinking approach, but more playful, and the audience in the kindergarten case is usually the creator him/herself or friends, not clients. He also acknowledges some flexibility in the process, a natural part of children’s play (unlike the stricter design-thinking process). He then goes on to describe how, inspired by the best kindergarten materials (blocks for building, crayons for drawing, dolls for role-playing, tiles for making geometric patterns), his group designs technological tools that are not overly constrained and allow children to express themselves in different ways. Tools that allow the creation of a diverse range of projects are ideal, allowing a variety of children’s authentic interests and passions to be expressed. In providing such technological tools, his group hopes to realize what they consider the greatest potential of technology in the educational context. The following excerpts highlight the broad potential of computers to help children learn — until educators and parents really look beyond the limited view of computers in the classroom as information delivery devices, communication enablers, or classroom aids (however great their potential is in those areas), the large investment in technology will not bear fruit. As parents and educators, if we want to support a similar cycle of learning and preserve the creative thinking mindset that is natural to kindergartners, it would serve us well to be mindful of this difference between digital access and digital fluency. The question remains whether this digital fluency can truly be achieved while using tools created by others (e.g. creating web pages using off-the-shelf solutions or creating simulated worlds within Minecraft) or only by learning how to code oneself. And is it that important for ALL children to be able to create in ALL media, including digital? In Part 2, I’ll take a closer look at the ‘teach all kids to code’ movement (crusade?). — ….both in digital and analog worlds, of course. Coloring books: mindful or mindless? The adult coloring book craze has been in full swing for several years now. The beautifully detailed books by Scottish illustrator Johanna Basford launched the trend in 2013, and, for a period last year, her “Secret Garden” and a follow-up, “Enchanted Forest” were Amazon’s top two best-selling books among all categories. The New Yorker places this renewed interest in a favorite childhood activity within the larger context of adults craving simpler childhood experiences; this so-called ‘Peter Pan market’ includes young adult books and summer camp experiences for adults (!). Much has also been made of the stress-reducing and digital-detoxifying powers of coloring and, indeed, the publishing industry boom apparently began in France in 2012 when publishers began marketing coloring books as ‘Art-therapie’, ‘Coloriages Anti-Stress’, and the like. Going further back, Carl Jung prescribed mandala coloring to his patients to relax and get in touch with their inner selves. This ‘meditative’ aspect of coloring fits in well with the current interest in mindfulness and slow living. So……chilling and relaxing is all well and good, and we could all use more of it, but as far as children’s creativity goes, the question arises…is coloring too limited an activity for young children? It’s hard not to consider it inferior to drawing if one views creative expression in a simple, hierarchical way. There are certainly those who believe it is harmful for creativity and that ready-made images set too perfect an example of what drawing should look like. This Artful Parent blog post sums the concerns up quite well and indeed, follows in the footsteps of Susan Striker, an art teacher who published a series of Anti-coloring Books in the late 1970s and 1980s to push back against the ‘mindless’ coloring trend of those decades. While the view of coloring books as ‘damaging to a child’s imagination and creativity’ is a tad extreme in my view, it is worth considering this issue. For most kids, drawing and coloring are usually part of a healthy mix of activities and a love for coloring books is only concerning if it pushes drawing aside completely. For me, the new popularity of adult coloring books brought my own childhood love (obsession!) with coloring books to the forefront. Like many children, I decided at some point that I wasn’t good at drawing and rarely did it. Educators have long noted that around age 9 or 10, many children lose confidence in their ability to draw because their ability to draw realistically falls short of their expectations. For many children, this happens even earlier and it’s worth being vigilant as a parent to try and delay it as long as possible! The simple act of drawing does indeed play an important role in a child’s physical, emotional, and cognitive development. Like no other activity, drawing allows young children to express emotions, experience autonomy, and build confidence. Unfortunately, as they grow older, children lose their confidence in and enthusiasm for the one activity that can give so much pleasure. Provide children with nontoxic drawing materials and loads of paper starting during the second year. Model drawing. Show children that you like to draw and make designs but do not model WHAT children should draw. Encourage drawing efforts by talking about the beautiful colors, pointy lines, and thin shapes the child has made. Rather than asking the child “What is it?,” invite the child to tell you about the drawing. Asking “What is it?” suggests that the child has failed to depict what he or she intended. Forego the temptation to provide coloring book type outlines for children to fill in. Instead provide a variety of shapes, colors, textures of papers, and a variety of drawing tools for the child to create his or her own drawing. Talk about concepts like thick, thin, wide, narrow, dark, light, edge, shape, contour, illustrations, artist, illustrator, straight, crooked, open curve, and closed curve. Display high-quality drawings at the child’s eye level. Include them in the dramatic play, book, and block areas as well as in the art center. Play beautiful music to accompany drawing. Talk about how the tempo of music changes the drawings. Give children the freedom to choose the subjects and colors of their drawings. We should not dictate how to draw or how to color the child’s project. If we do that, it becomes the adult’s project which the child is forced to emulate. Rather than drawing for the child, ask helpful questions and make suggestions. Encourage children’s efforts and voice confidence in their ability to solve their drawing problems. Here is a schematic showing stages of drawing development (in which the text might be more useful than the image) and another useful reminder of How to Talk to Kids about their Art. Meanwhile, back to the adult coloring craze — I recently tried it again and can’t deny its calming effect. It does feel a bit mindless, but that’s sort of the point, at least for me. A bit like “meditation-lite”, but that’s still a win, given how hard it is for me to meditate. I don’t get around to it very often, but Lila, our 5 year old, and I love the Secret Garden series and these colored pencils for its detailed drawings (artist fave Prismacolors and ergosoft Staedtlers, both upgrades from the set of 50 Camel oil pastels I used to request every August for my Rakhi gift as a coloring fanatic in India). In the end, comparing coloring to drawing is probably a bit unfair; while drawing is more creative and serves an important expressive role, relaxing with a bit of ‘easy’ coloring has its place, too. So thanks Johanna Basford, and thanks to you for reading! Like many parents, I’ve felt a vague sense of panic about the cookie-cutter arts and crafts projects that most young children are introduced to in preschool. The act of gluing together pre-cut shapes and googly eyes to create the same final product as all your classmates seems to provide little more than an opportunity to practice motor skills and the ability to follow instructions (oh and to sit in a chair long enough to complete the task!). These ‘make and takes’ (as an arts educator once described them to me) were one reason we chose a Reggio Emilia -inspired preschool for our kids. Through the preschool and the wonderful Artful Parent book and blog, I began to value the process, not simply the product of our preschoolers’ creative output. BUT I struggled with this shift in focus from product to process nearly as much. A simplistic “process not product” approach leaves parents and teachers paralyzed by an “anything goes” and “it’s all art” mentality, making it difficult to formulate meaningful feedback, or to help children develop specific skills or learn how to use art tools for genuine self-expression. 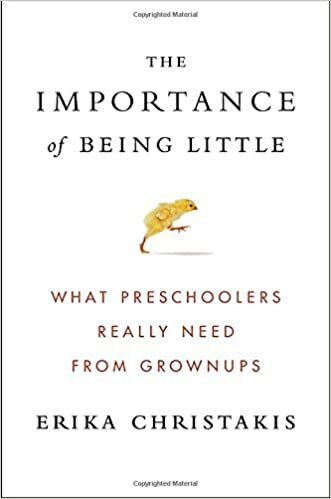 So I was relieved that Erika Christakis, of the Yale Child Study Center and an experienced preschool educator (and parent), addressed this issue in a chapter titled “Natural Born Artists” in her new book The Importance of Being Little (February 2016). It’s critical to pay attention to this with preschool-age children, because as children get older, the majority get more goal-oriented and creatively inhibited. I’ve heard many arts educators bemoan the fact that by the time children reach middle school their creative confidence is often very low. At home, I’ve seen our 5 year old already focus her art making on the product and on adult expectations (because of her more traditional preschool start? her intrinsic goal-oriented nature? ), compared to our 4 year old, who is still happy to make meaning from his elaborate color creations that have no identifiable shape. There’s so much more to discuss about this topic (and Erika Christakis’ book), but for now, I’m working on the first step: encouraging more authentic art making processes for my kids and letting them explore a variety of high quality materials to make something that has meaning for them. For a nice, direct summary of Christakis’ chapter on Natural Born Artists, see “Why Preschool Crafts are a Total Waste of Time” by Melissa Dahl in NYmag.com’s Science of Us.